Prices for all of our various configurations. All of our rates - by category and add-ons. Thru-the-lens or stand mounted prompter with beamsplitter for placement in front of subject. Thru-the-lens or stand mounted prompter with beamsplitter for placement in front of interviewer. Qualified operator for delivery, setup, and adjust. 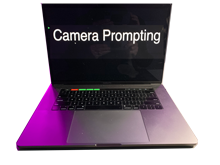 You'll need to provide an EXTRA camera for placement on the prompter in front of the interviewer. BOTH cameras must output an NTSC/Composite signal for feeding the other prompter screen. We highly recommend your sound department come prepared to mic the interviewer and feed a small anchor/speaker placed near the prompter in front of the subject. This makes it more natural for the person being interviewed, as he/she will hear the voice coming from the prompter screen rather than have to look at the interviewer's face in the screen while hearing their voice come from somewhere off camera. (2) LCD 15" monitors with stand mounts. (2) Custom C-Stands for low to extra high extensions. These rates are for NON-Union prompting needs. Most stage/meeting venues within San Francisco are under IATSE Local 16 jurisdiction, and require a different rate structure. See our page on Union Venue prompting solutions. For San Francisco venues under IATSE jurisdiction, our rate structure is slightly different than other venues. In these cases, we rent you the teleprompting equipment, and then you hire one of our operators through the Union -- and payroll that person separately. OUR person will be put on your payroll -- whether it's your company running the payroll or a labor contractor -- though we don't know the hourly rate for this. We do know that Prompter goes into the labor call as Head of Department and is on an 8 hour minimum. Because you'll be booking our operator through your labor contractor, our person will arrive with the gear on the initial call, and will strike and return the gear after teardown. Short Turnaround (Less than 8hrs bet. shifts) operator is paid at Overtime rate.